We’re excited to announce the arrival of a new way of keeping track of your SOAR-assisted SSA disability applications. It’s web-based, easy to use and can be accessed anywhere. Of course, I’m talking about the SAMHSA SOAR TA Center’s Online Application Tracking Program, also known as OAT. So far 25 states and 300 different agencies are using SOAR. Almost 1250 cases are currently in the system and more are signing up every day. Located on a secure website, case workers can keep track of their SOAR initial and/or appeals applications with a simple log in. Agency supervisors, SOAR local community leads and SOAR state team leads can access outcome data at any time and create detailed reports that can be used to help support their SOAR efforts, leverage new funds, and encourage collaborations with other community partners. 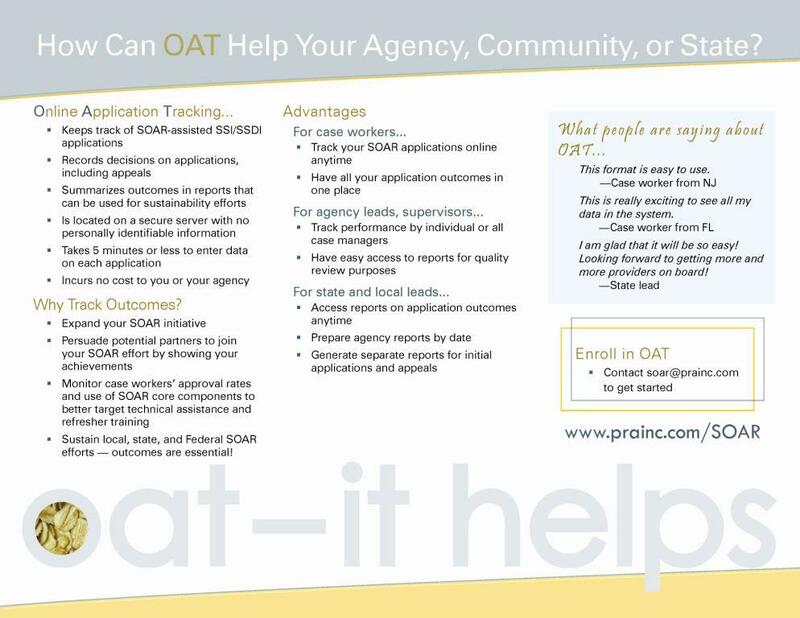 Two webinars were held last winter to introduce OAT to the SOAR community. 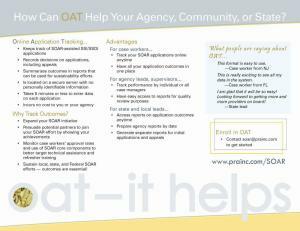 There is a registration process to ensure that only those doing SOAR applications have access to OAT. All data entered into the OAT program is completely confidential with no personal identifying information collected. Each case has a specific ID created by the case worker so tracking individual cases is easy. If you have used the SOAR Microsoft Access-based data tracking program, we can convert and upload your data onto OAT easily.